Six members of the House of Representatives urgently called for the public release of a classified memo detailing extensive abuse of government surveillance by public officials. They say its contents undermine the foundations of democracy and will result in the removal of the officials and people going to jail. Meadows’ comments were echoed by at least five other House members: Steve King (R-Iowa), Lee Zeldin (R-N.Y.), Ron DeSantis (R-Fla.), Matt Gaetz (R-Fla.) and Jim Jordan (R-Ohio). All members of Congress were briefed on the memo after the Intelligence Committee voted Thursday to release it to lawmakers. All of the Democrats on the committee voted against releasing the memo. All of the Republicans voted for the release. The memo is a four-page summary of the House Intelligence Committee’s findings on extensive abuse of the Foreign Intelligence Surveillance Act (FISA). The contents include information on the discredited Fusion GPS dossier which was used in part to apply for a warrant to spy on members of the Trump campaign, according to Sara Carter, an award-winning security journalist. 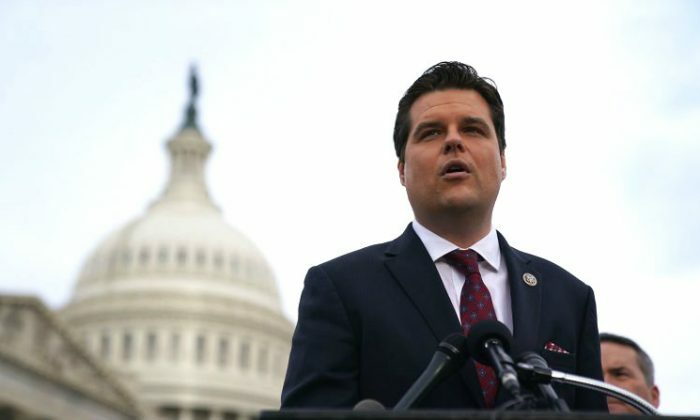 The information in the document will lead to the firing of government officials, but it won’t end there, Gaetz told Fox News. Senior government officials who chose to remain anonymous told Carter that the contents of the memo could also spell an end to Special Counsel Robert Mueller’s investigation into claims that Russia colluded with the Trump campaign to influence the 2016 presidential election.